"Hand in Hand" is an entry for the CCTV Dance Contest held a few months back in China. It was performed by disabled dancers Ma Li and Zhai Xiaowei who moved and inspired the audience in equal measure with the performer's sheer dedication and talent. "Hand in Hand" was the first entry from some disabled dancers in the four occasions that the contest has been run. Both the dancers had lost limbs as a result of car accidents. Ma Li lost her right arm and Zhai Xiaowei his left leg. Their dance is about how people overcome life's frustrations and enjoy the happiness of love. Dancer Zhai Xiaowei said, "After all, we're disabled people. But we dance with our heart and soul." Dancer Ma Li said, "It's the power of love and the strength of joining hands, which keeps us persevering." More links to their interview and tv shows in can be found at YouTube. Click on more on the right side. I don't get it. Was one of them disabled? LOL Splunch. You don't get my humor. Neither of them is disabled! In my opinion, "disabled" is the most politically INcorrect thing to call an amputee. I'm the MOST able person I know. But then, I don't hold a candle to those dancers. Meet Adam, an amazing 2 year old skateboarder who is also the world's youngest skateboarder. A slideshow outlining the construction of a 200 square foot mural tributing Calvin and Hobbes, made entirely of Post-It notes. 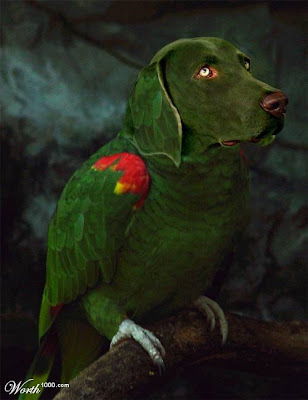 Weird Animals created using Photoshop! Have you seen before these animals? Some of them do look cute and funny, but others seem a bit too weird. Who knows maybe one day such hybrids may be actually created! Much more images after the jump.